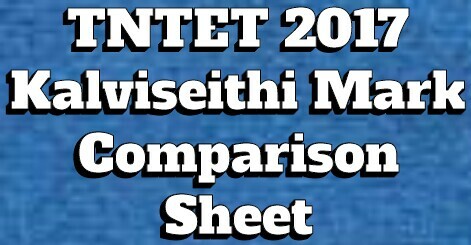 Kalviseithi has created this page to enter and compare the Cutoff Mark Details of the TNTET 2017 Candidates. Candidates are requested to Enter your Mark Details Only Once. Click below Links To View All the Entered Datas. I am tet pass 94 sc job kidakuma? major engliah p2 my cut of 68.73 caste mbc, any chance this year? 112..Bc female ..english.. cut off 77 .. any possibilities? Last year maths counsling weightage mark enna? I am mbc female i got 88 in 2017.my cut off 64 and my major botany.is there any possibility? Hi I am amthan s. And my cut of 69.13 maths major .SC male. Can I expect job? i got 89 marks in tet...major history ...weightage 66.52 MBC/DNC...is there any possibilities???? Mbc female botany cut off 63 in 2017.any possibility? I have got 93 p2 ( maths ) . MBC . and my weightage is 67 only, is there any possible to get job frnds . Could anyone reply me. BC Female P2 93 Qestions correct (maths). Major Weightage is 70% it is possible. My mark is 101 and weightage is 71, BC,English major,is there any possibility? cutoff 64 maths Bc.female.any chance to get job?please any one reply. im paper2 english 2017 my cutoff 68.11(BC). if there any chance to get job?. pls any one say last year english cufoff marks. sir 1114 vacancy nu sonnanga. but 390+ thaaan list viturukanga. next what happen? balance peoples ku list varuma? English 108 cut of 69 mbc female any chance this year? Hi i got 86 . I am maths major and BC community.cut off64.8.is there any chance. Paper1 weightage 63.35 ST any chance?? Tet p2 83 maths weightage 64.27 BC community job ????? Xth Std Memory poems MP3.